The use of tests as part of job selection and assessment procedures has now become routine. Most candidates can expect to face a battery of tests, including those which identify a person's aptitude for a particular job. "How to Pass Advanced Aptitude Tests" is aimed at those applying for positions of increased responsibility, where the selection procedures can be even more rigorous. It will familiarise you with the types of test you may face so that through practice you will improve your scores. This second edition now includes detailed explanations with every answer, to ensure that you learn and gain the most out of the practice tests. 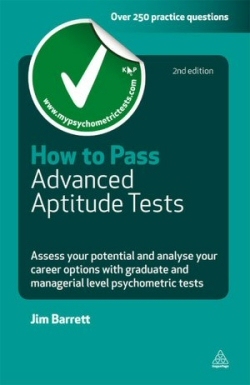 Also featuring personality and career analysis and an occupational index and career agenda planner, "How to Pass Advanced Aptitude Tests" shows you which career path might be the right one for you, and assesses whether you are currently in the right job.